Nestled into the limestone cliffs in Arizona is Montezuma Castle, one of the best-preserved cliff ruins in the country. VERDE VALLEY, Ariz. - It seemed that Sedona, Ariz., had received too much advance publicity when we visited earlier this year. The hype - "a mesmerizing experience," "breathtaking monoliths," "spectacular scenery," "the most beautiful setting in America," "a once in a lifetime experience" - made it sound like an instant Venture Bound story, but it was hard to get a handle on what to say about it. We did take a pleasant guided walking tour of nearby Red Rock State Park, walked along the rushing waters of Oak Creek and visited two excellent art shops. 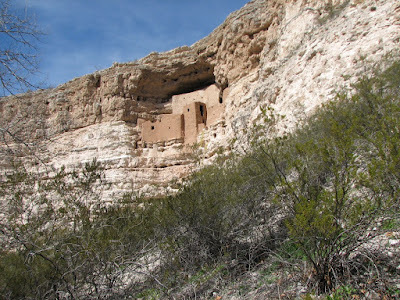 We found our story south of Sedona at Montezuma Well and Montezuma Castle. Leaving Interstate 17, we followed another car five miles over a winding dusty road, always managing to stay far enough behind so we could see the road, but not far enough to keep our rental car from becoming coated with a thick layer of dust. Sitting in the Upper Sonoran Desert, Montezuma Well is 368 feet across in an ancient cavern fed by subterranean springs of 76-degree water year-round. A side cave in the limestone cliffs takes the water down the hill to form Beaver Creek. The experts claim the well has been producing an unvarying 1½ million gallons of water a day since prehistoric times, but even using dye and divers, they have not been able to figure out where the water is coming from. In any case, this became the center of a settlement for Sinagua Indians from 900 to 1400 A.D. The name is Spanish for "without water" - sin agua. Despite their name, the tribe used stone tools to dig a mile-long canal from the creek to the flatlands to irrigate their corn, squash, beans and cotton. It took us a while to spot the cliff houses underneath the rim of the cavern because they were the same color as the surrounding limestone. Entry to these houses would have been by wooden ladders that could be pulled down to prevent interlopers. Wayne took a walk on a steep path leading down into the cavern, where there were some pit houses being restored. Debris on the ridge of the cavern and surrounding hilltops was the remains of pueblos, from one-room houses to community houses of as many as 50 rooms. About 12 miles farther south, we arrived at Montezuma Castle National Monument. After taking in the visitor’s center, we stepped out into the open space in front of the cliff dwelling and found ourselves properly impressed. Nestled into the limestone cliffs 200 feet above the flood plain of Beaver Creek was one of the best-preserved cliff ruins in the United States. There stood the five-story, 20-room high-rise apartment where Sinagua Indians had lived for some 300 years. Montezuma had nothing to do with the area, but early settlers assumed the imposing dwellings were connected to the famous Aztec emperor. We learned at the visitor’s center that the area had been abandoned at least 100 years before Montezuma was born. The area would have supported about 200 people. Archaeologists have excavated mounds of broken pottery, worn-out tools and animal bones that have allowed them to reconstruct the Sinagua lifestyle. Life evidently was good here for 300 years with good crops, fishing, and animals to hunt. Then, sometime in the 1400s, the villages began to be deserted. Why? No one knows for sure, but theories include disease, drought, overpopulation, invasion, breakdown of the trade networks or perhaps intergroup strife. The Hopi Indians, who consider the Sinagua their ancestors, have a legend that might provide a clue. In a brochure by the Southwest Parks and Monuments Association, Fred Lomayesva of the Hopi Snow Clan notes: "It happened a long time ago. … Life became too easy and the people became complacent. It was as though they had forgotten who they were and how they should live. The village was in a state of shameless corruption. One day, the village began to shake and the houses caved in. Water gushed in and filled the hole where the village once stood. Suddenly, a great serpent rose up out of the water in anger at what the people had become. Upon seeing the serpent, everyone became very scared and ran away to the north and east, never to return." About a million people a year visit the area, and although there are no motels or camping facilities in the immediate area, Camp Verde is nearby, and Sedona is 30 miles away.